Daryl Johnson (Worcester Park, United Kingdom) on 1 February 2009 in Documentary & Street and Portfolio. Great street shot! Very well composed and the woman`s silhouette is almost detached from the seen. I think this depth of field is fantastic. The silhouette of the woman is such great contrast and so perfectly still against all the activity just beyond her. Excellent shot and tones. You took the picture from the right angle. The silhouette of the woman against the zone of maximun ligth enhances her posing and at the same time puts her apart of the rest of the people. Waiting lonely in the midst of the crowd. Very good. 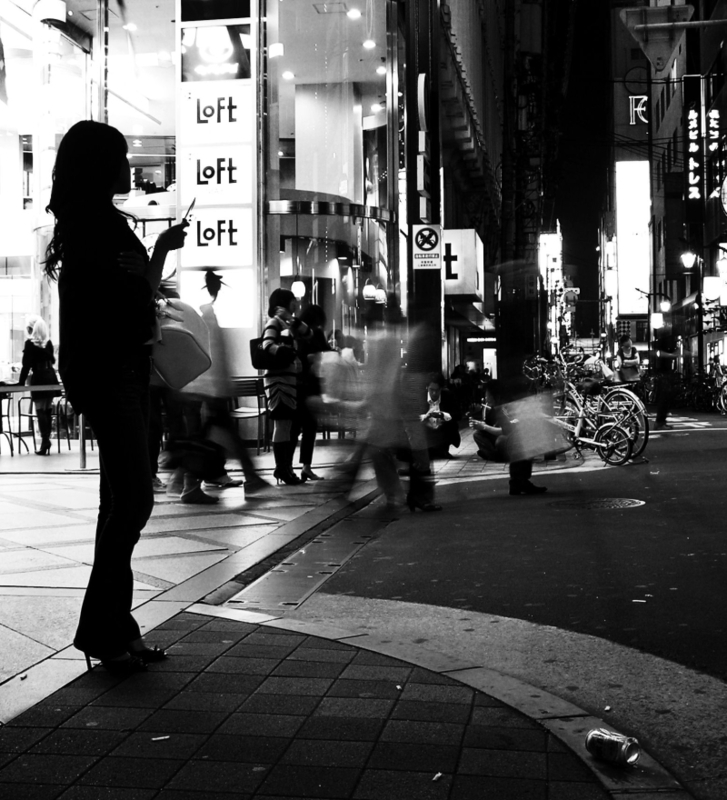 wonderful B&W street photo....I love that sillouette! This is wonderful, nice contrast! Great blurred DoF and silhouette. Blurred people and woman's silhouette make a interesting atmosphere. Great capture. The woman's silhouette makes the image. Very nice Daryl , love the contrast and the silhouette against the light ! Great composition and b&w! Love the still lady's silhouette in the foreground and the blurred people behind. Great shot! This is really great !!!! superb black and white!!!!!!! nice! I love the lady's sillouette and the motion of the people crossing the street!! So rich for the eyes : lines, buildings, words, motion blur.... you caught life on the street ! Careful - she's got a knife! Or at least that's what people would have thought 20 years ago before the cell-phone-pose became so commonplace. Great dynamic scene! @Damon Schreiber: Cheers Damon! Yes, she is looking a bit threatening there I suppose...! The silhouette seems to have been cut with a pair of scissors - great ! That's a super image. I especially like the strong silhouette on the left and the cool lighting. Fine streetphoto, with the special contrast of the right dark side and the lift bright side with the silhouette. Excellent shot of the night time shoppers, I like the action blur too. nice perspective to reflect life in the street,... Well done! brilliant work, the stillness and motion perfectly captured. haha..i didn't know the fact Damon pointed out in his comment.Yeah,a good shot. @Kheoh Yee Wei: Thanks Kheoh! Great capture. The woman's silhouette is superb! contrast is simply brilliant ! Neat. I wish I could take images like this without having to make a four hour round trip drive. Hi Daryl, congratulations for the spot light! A nice picture indeed with that young lady silhouette. Daryl, so kinetic and full of energy. Brilliant! good stuff. i like the high contrast look.